The ECG is a fundamental diagnostic tool in cardiology, allowingaccurate diagnosis and monitoring of acute and chronic ischemicheart disease. In this most comprehensive book of its kind,internationally renowned authors correlate electrocardiographicrecordings with anatomical patterns of myocardial ischemia toimprove the diagnosis and management of patients with ischemicheart disease. The book is structured in two sections. Part One coverselectrocardiographic patterns of ischemia, injury andinfarction. 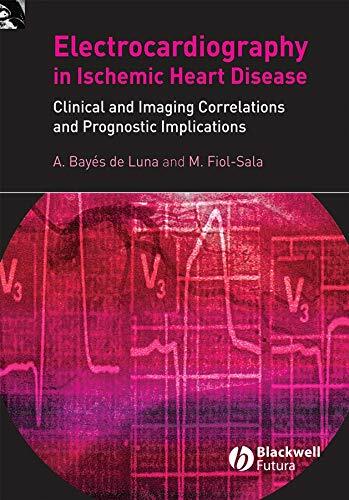 • Each chapter discusses a different ECG abnormality inturn, clearly explaining the ischemic insults andelectrophysiological mechanisms underlying each pattern to promoterapid and accurate interpretation of the ECG in the clinicalsetting. • ECG abnormalities are correlated with myocardial anatomyand coronary angiography to produce a series of practicaldiagnostic algorithms that allow the clinician to identify not onlythe occluded artery but the precise location of the occlusionwithin the artery, facilitating appropriate therapeuticdecisions. • The authors also propose a new classification of Q-wavemyocardial infarctions based on imaging correlations with advancedtechniques such as contrast-enhanced cardiac magneticresonance. Part Two of the book covers the ECG in clinical practice. Eachchapter focuses on a different clinical syndrome, describing therole of the ECG in a global approach to the diagnosis, prognosisand risk stratification of patients with acute and chronic ischemicheart disease and guiding clinical decision-making. Extensively referenced and illustrated throughout, this book ishighly recommended for any clinician involved in the diagnosis andmanagement of ischemic heart disease.